An extremely talented musician is hoping her wildest dreams come true as she aspires to follow in the foot steps of 10 time Grammy Award winner Taylor Swift. 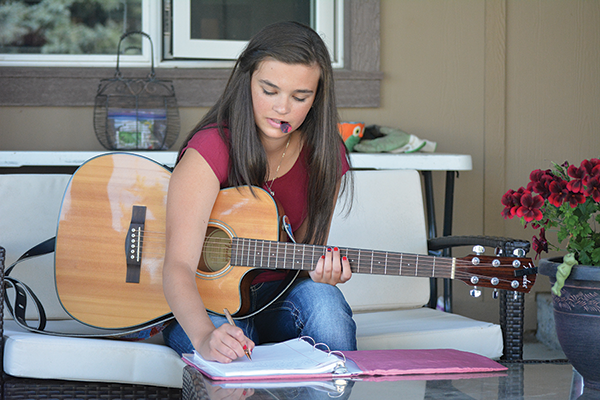 Taia Bohne is a 14 year old singer/songwriter from Raymond and has been writing music since she was 11 years old. At the age of 12, she picked up a guitar and quickly learned how to play. With those two skills on top of a passion for singing, which started at a very young age, Taia has written over 60 songs and is ready to put her career in full swing. Writing new songs can be a challenging thing to do, but it’s something Taia really enjoys and she is willing to push herself. “Song writing is not easy. It’s a lot of work to find good lyrics and I have a big thing about rhyming. That sometimes gets in the way and it takes me a while to find lyrics that I like,” said Taia. Writing can often be a creative way to get things off your chest and Taia uses it as a way to convey her thoughts. “I really enjoy it. It’s something I do when I am feeling emotion and need a way to express what I am feeling. Especially when I am going through hard times with friends. That’s what got me into writing,” said Taia. Taia watched interviews of when Taylor Swift was younger, where she said she started writing when she was twelve and wrote about her struggles with friends. It was something that really stuck with Taia. “I defintely write about similar stuff because she has a lot of relatable songs. It’s really inspiring that she made it so big and started right where I started,” said Taia. Shondi, Taia’s mother, really started to see her talent at a very young and appreciates what she has been able to do with it. “Taia had written a song when she was 11 and my husband and I thought it was really good. I’ve tried to write songs and it’s tough. It’s a really great talent that a lot of people don’t have,” said Shondi. Taia recently played at the Magrath Talent Show in front of hundreds of people during Magrath Days and placed second. Although she didn’t win the competition, it was the biggest stage she has ever been on and found the experience to be extremely rewarding. “It’s really exhilarating and there were so many people there supporting me and who wanted to listen to me play. I had friends in the audience and I just love performing for people. I find every opportunity to play in front of people,” said Taia. Taia continues to push herself and aspires to one day be recognized on a larger scale and understands that it takes a lot of hard work and dedication. “I spend two or three hours a day on song writing and guitar, but I am listening to music 24/7,” said Taia. Her dedication is something her family notices and are pleased with. “We are super proud of her. It’s exciting to see her progressing, she works really hard at it. You can do great things if you work at it,” said Shondi. Taia is always eager to play in front of crowds and will be performing at the Lincoln County Fair in Eureka, Montana on August 27 and will be opening for Jason Lyle Black at Chautauqua on August 12. She has also started her first Youtube channel where she hopes to get more exposure and is ready to fill in her blank space.